If you have a business, you already know the importance of your computer backup in case of a system crash or file corruption. The IDrive system state backup is the backup of critical system related components that you can restore in the event of a system crash or failure. Perform quick, easy and secure backup of critical system components such as registry, boot file, active directory, system volume etc. You can back up these components to an offsite location without interrupting the running applications on the machine. 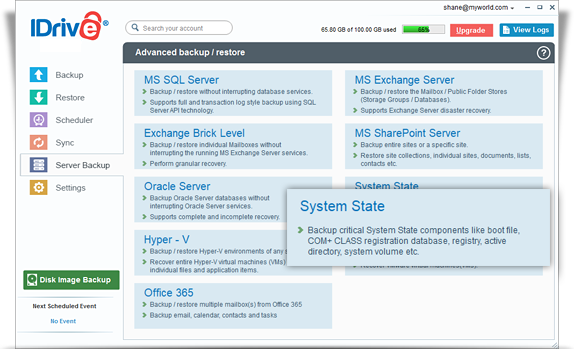 View the steps to backup System State to the IDrive account. Efficiently restore all the important system state components in a secure and reliable manner thus ensuring business continuity in the event of system crash. View the steps to restore System State from the IDrive account. Client systems: Windows 2003, Windows 2008, Windows 7 and Windows 8.